Christmas is over, the champagne shudders of post-New Years are gone & all us rats are back in the race looking eager-eyed towards summer relief. Today’s thing to do is no mouthwatering meal, no eye widening show or wallet draining activity. Today’s thing to do just… is. Dr. Sun Yat-Sen Chinese Garden should be a stop on any east downtown stroll. Nestled amidst the cluttered shops & kinetic atmosphere of Chinatown, this place has the Jedi-like ability to stop you in your tracks, forget whatever thought you were dwelling on & be entranced by the scene before you. I’m always surprised by how much space is hidden within what seems to be a small area. In the warmer months, watch toads the size of chickens squat contently around the pond, turtles & trout-sized coy snaking around the lotus flowers. 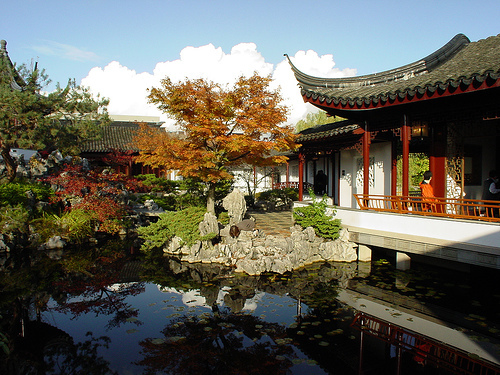 Wander the winding paths, strategically arranged rocks & enjoy the tranquility this classical Chinese garden (the first outside of China) offers. Here’s the best part, it’s free.